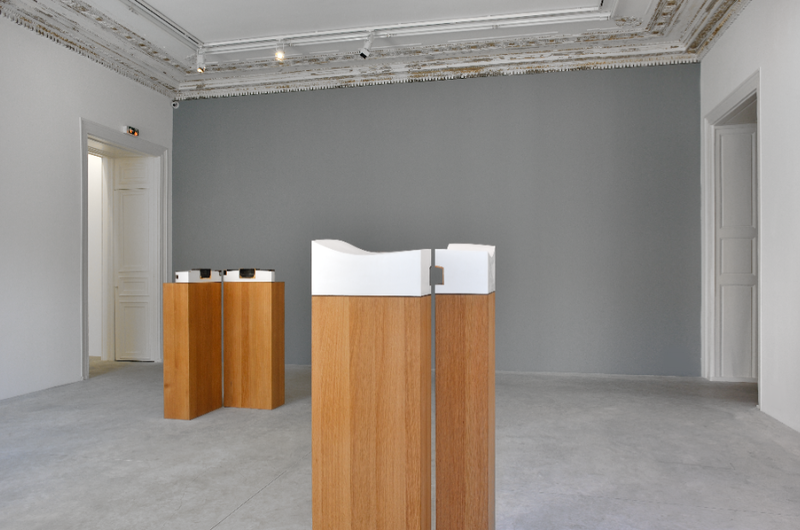 James Turrell is a pioneer in perceptual art using light as his medium, and Almine Rech Paris, capitalizing on the artist’s current nationwide exhibition in his native United States, is currently presenting his seventh exhibition in its gallery. 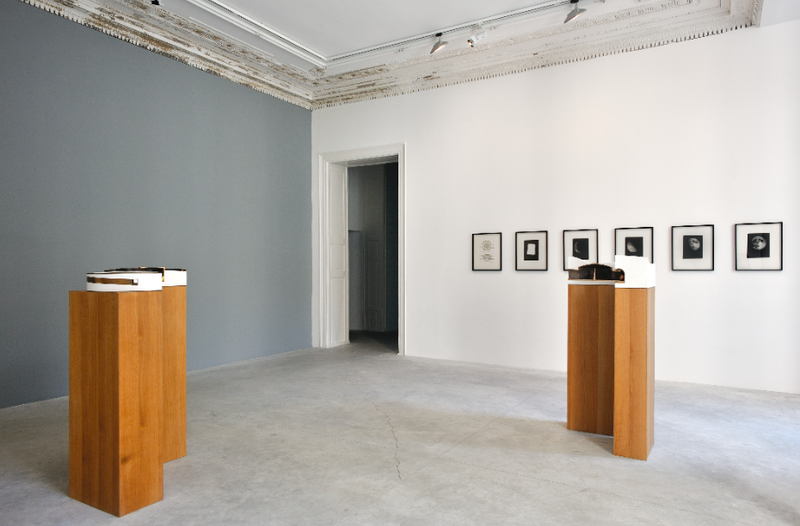 Shown across three rooms, this collection offers insight into Turrell’s celestial inspiration for his abstract pieces. Visitors are first greeted by two bronze and plaster casts, Craters Eye and Sun and Moon Space, two small models of Skyspaces split down the middle, inviting viewers into their interiors. These mimic large-scale earthworks which are central to Turrell’s career, including his ambitious Roden Crater project in Arizona, where Turrell is constructing a series of naked eye observatories like the two here. Other works, like Meeting, on permanet display at MoMA PS1, provide a more modest, albeit entrancing, experience, in which Turrell cut a square frame into the roof of the museum to allow visitors to watch the sky. Craters Eye references Meeting in its structure. One can imagine how the sun would cast progressive archs across its circular interior from its open ceiling, although this installation lacks the benches for viewer to experience the work. In fact, were the work intact, it would not provide any enterance for admittance. The more complicated Sun and Moon Space is supplemented by schematic drawings hung along the back wall. One shows its floor plan, indicating how light would enter from each side. The other is a detail of the central sculture within it. This twisted obelisk would reflect light off its guilded finish against the matte walls, turning the beams from their point of entrance to reflect across the circular interior. 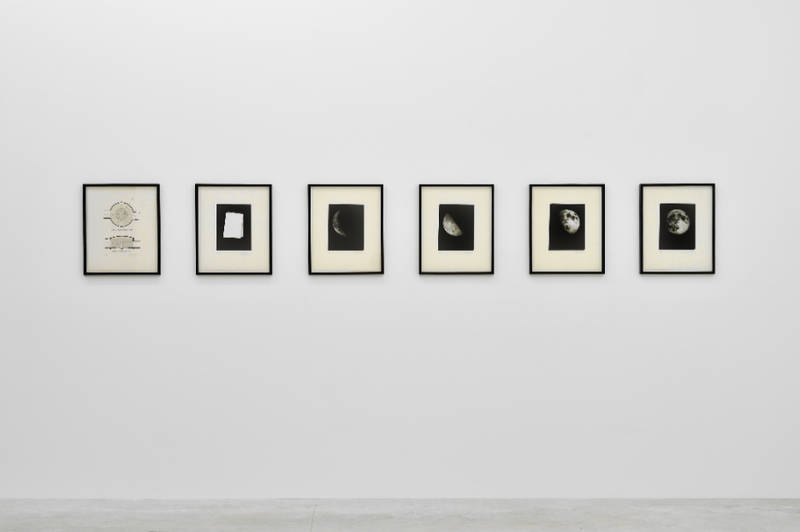 Alongside these drawings are a series of etchings titled Image Stone: Moon side, taken from photographs of different phases of the moon. 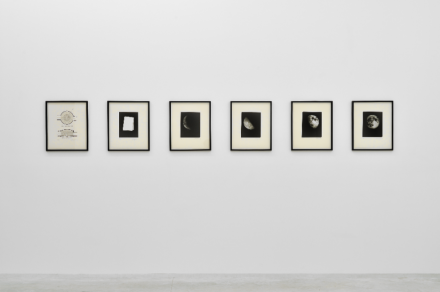 These serve as a scientific map of the the reflection of the sun across the moon’s surface as well as a jumping off point for Turrell’s compositions. The schematics and photographs provide a theoretical groundwork for the Skyspaces. 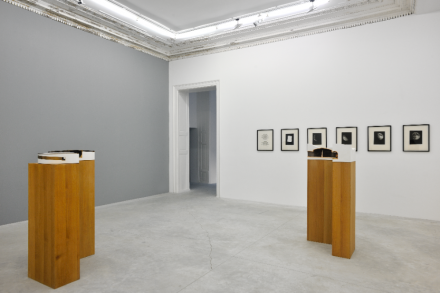 Even so, the potential of these works is not fully realized until the viewer has progressed through the exhibition. 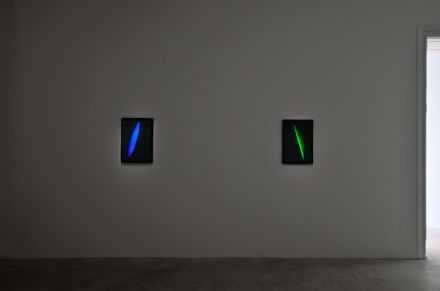 In the second room, a series of four light reflective works put Turrell’s investigation into action. Each work shows a streak of color which morphs from a bright line into an extended shape with the viewer’s perspectival shifts. The phases of the moon mirror the gentle curve of XXX_B – OUT ELLIPSE, and the position of the viewer dictates what is seen across the black frame. XXX_C OUT TRIANGLE explores a sharp geometric shape receeding into the background, giving the illusion of space within two dimensions without breaking the picture plane. These light reflective works are projections which evade physicality. They do not have weight or matter but an energy, activated by the viewer. 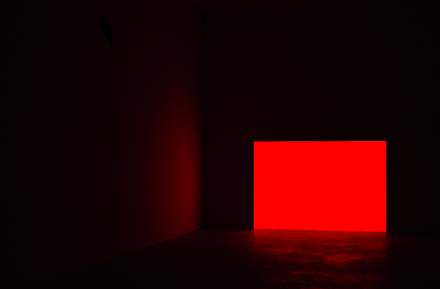 The final room explores this relationship between energy, light, and perspective with one work, Prado, Red. 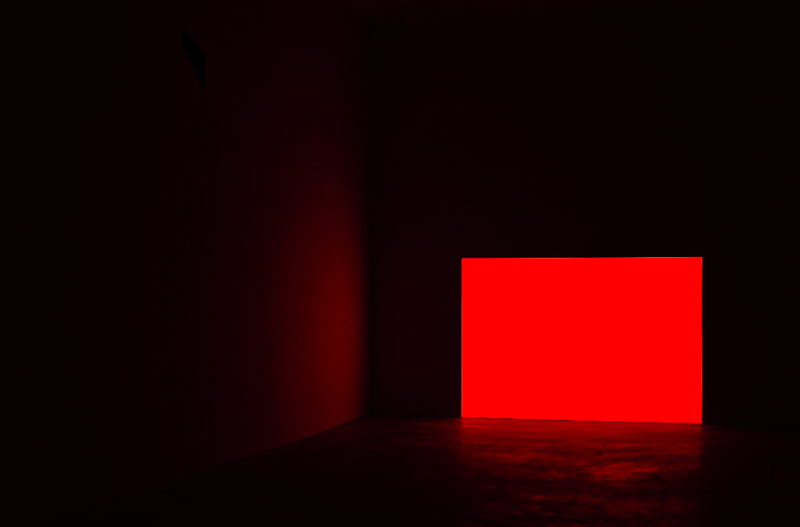 A red rectangle is projected near the corner of the room, its bright form starkly realized, and its ubiquitous color eliminating all blemishes from the wall in a flush of red. This work is likely inspired by Turrell’s studies of the Ganzfeld effect, which explores the experience of perceptual deprivation often through exposure to uniform color fields. The result of this unchanging signal to the brain can result in temporary blindness, hallucinations and altered states of consciousness. 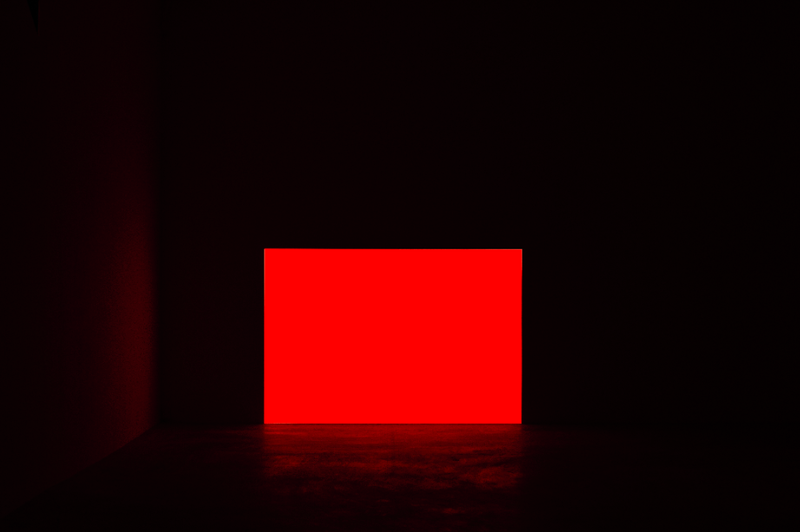 While Prado, Red references the Ganzfeld effect it remains an object of perception, epitomizing Turrell’s central goal, as he explains, “I use light as a material to work the medium of perception, basically the work really has no object because perception is the object. 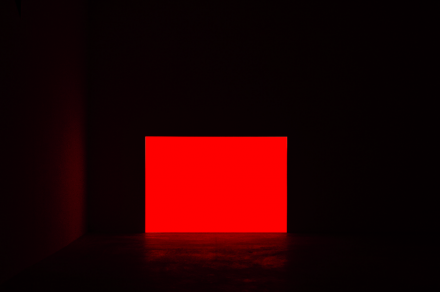 And there is no image because I am not interested in associative thought.” Indeed Turrell is most interested in creating an experience between the viewer and his work through the energy and material of light. 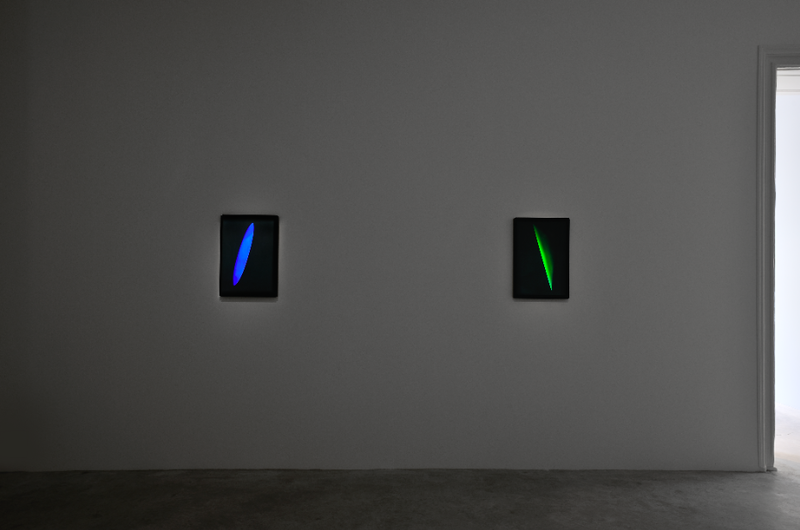 His pieces cannot be fully realized without an extended viewing, for instance to experience the movement in his Skyspaces or the psychological effects of his projects’ color fields. His show is on view until July 27th. 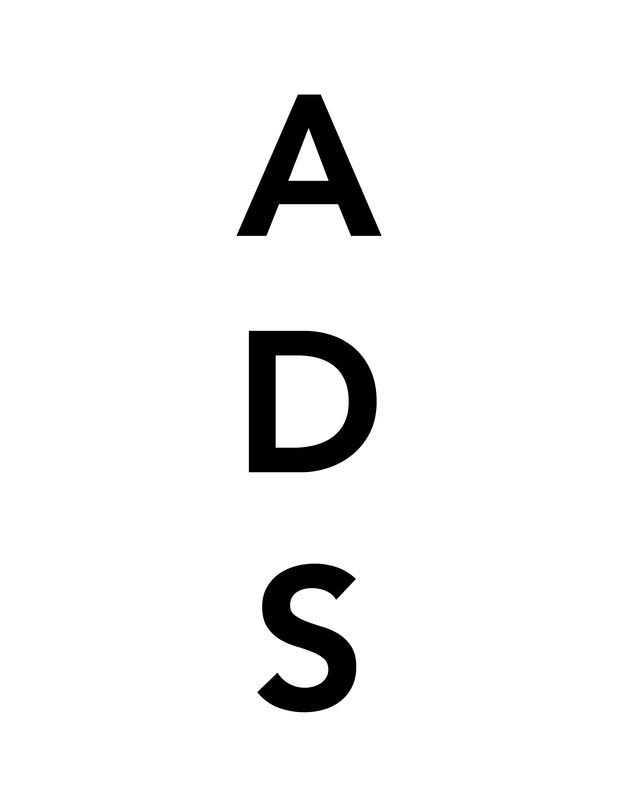 This entry was posted on Tuesday, July 23rd, 2013 at 9:02 pm	and is filed under Art News. You can follow any responses to this entry through the RSS 2.0 feed. You can leave a response, or trackback from your own site.